Melissa from Milton, Ontario, wrote to tell us of her Wolf sighting ..... Walking my two little dogs this morning down at mill pond Milton, Ontario, around 10 am; my husband and I parked our car in the small parking area beside the railroad tracks, we had our dogs off the leash and are always very cautious of our surroundings always in that area for other dogs and wildlife. We were about 200 yards from the top of the trail looking up the small incline of the trail, and right there before us, stood in the middle of the trail at the very top looking down at us, out of nowhere, was the huge grey and white what we thought first was a husky, then automatically realized it was not a husky or Coyote it was a huge Wolf, I kid you not. We quickly picked up our dogs and walked swiftly back to our car, good thing the dogs did not see the animal, they would have barked at it for sure. my brother who I told the story to, thought it might be a Coy-wolf - hybrid of a wolf and coyote. He recently saw a documentary how these hybrids animals from Algonquin Park are migrating to southern Ontario and will be the next main species for the next 50 years. we love the trail at the pond, it is cool place to walk the dogs on a warm day, and peaceful, but no more, I don't care what time of the day it is, will not take that risk even with my 2 little dogs on a leash. So for all those out there please beware when walking your dogs down there. Sandra wrote to tell us ..... A friend of ours was confronted by a lone Wolf while walking his dog near the marina on the North Service Road in Stoney Creek. The Wolf was out around 10:00 pm on the path near the tennis courts. There is a park right next to these tennis courts. 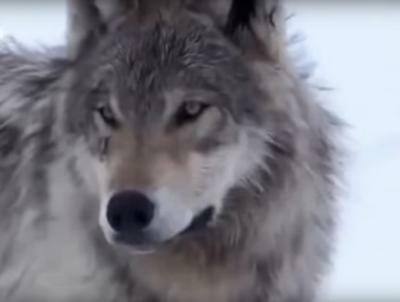 This hasn't been the first time a Wolf has been spotted in this area. A reader from Freelton told us ..... I'm quite sure I saw a grey/brown skinny Wolf at the back of our property bordering highway 6 and 97. Far too big for a Fox, and would have to have been a massively tall Coyote. It was all alone as far as I could see. Stan, from Lambton County wrote to say ..... Last Saturday morning I was having coffee and looked out my back window to spot a large dog-like creature. It was about 100 yards away at the most. It was larger than a few Coyotes I have seen. It was walking briskly along the bush near the bank of the Bear Creek which straddles our property near Zion Line. I thought it might be a "Coywolf" but after viewing pictures and looking at a Grey Wolf video, determined, that is what it resembled most. Unfortunately, when I got the camera, it was gone. Thank you all for sending us these reports of your Wolf sightings - I find it very interesting to read about Wolves in Southern Ontario! I live 5 minutes from Beaverton and one afternoon I saw a beautiful red wolf run across the road. I was amazed at how healthy he looked. I have seen many coyotes over the years, this was not one of them. Looked it up and I’m convinced it was a red eastern or now they are called Algonquin wolf. Less than a week later my husband saw two wolves taking down a deer near the area I saw it in. I was driving to work this morning at approximately 5:45 am. I was on Palmer Rd headed north to Moira Street West when it ran in front of me on the road. I had seen it in my peripheral and had slowed down preparing for it to run in front of me. I came to a complete stop and it also stopped once it crossed and looked right at me. It was grey brown and far too big to be a coyote and it most certainly was not a dog. I told a co-worker about it and she stated she had also seen the same type animal right in the industrial area where we work the very same morning. Hi. I live in the hamlet of Windfall (near Woodstock, Ontario) and over the past few months eastern wolves have made themselves known here. It seems to be a pack of five and they are very organized. We have seen them post sentries during a hunt and have heard them off and on during the night. There are also many coyotes in this area. But these are definitely wolves.